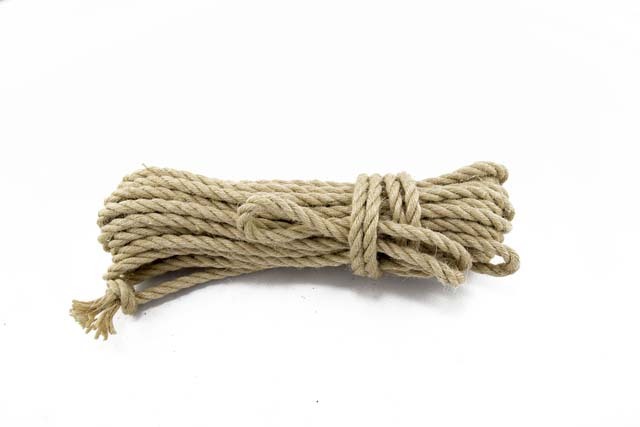 Osaka is a relatively new product, without a doubt my favourite rope to date, which is destined to be a best seller. It is the closest so far to Japanese jute (asanawa) which is the 'gold standard' of serious riggers but come with a champagne price tag. The lay (twist), weight and density is almost identical which gives it superb flexibility and handling right off the reel. For this reason, we only recommend dry treatment. I advise against wet treatment as there is no benefit and it is all to easy to damage loose laid rope such as this. In some recent break tests by Fetlife members, Osaka was comparable with the best Japanese ropes and better than some. Surprisingly, Osaka is my strongest jute rope by diameter. Each ply is made from 9 yarns to give a fine and consistent rope. This combined with the lower density will make your ties, knots and frictions look very clean and sharp. At 12g per metre for the 5mm and 15.7g for the 6mm, this is fast, flickable rope. Supplied in 8m (26ft approx.) and 10m (33ft approx.) lengths finished with a simple knot. The diameter is very accurate as you can see from the comparison with a standard pencil (* see note below).The fibre is a pale golden brown and clean with minimal impurities. It's so soft that it can be used as is, just like the best Japanese rope. If you are really fussy, just singe off the fuzzies, which are minimal, and treat it with oil or wax, e.g. NaWaX. However, it will break in and mature beautifully with just a bit of use. Apart from Tossa Lite, Osaka is my lightest, most flexible and least dense rope.